Just give me the frosting! Happy Valentine's Day! What more fitting than to bake red velvet cupcakes and we're giving Toronto some love again because the recipe is from Bobbette and Belle. Our friend has been giving non-stop raving reviews of Bobbette and Belle's red velvet cupcakes and generously lent us her cookbook and encouraged us to bake it. Baking the red velvet cake was a piece of cake...except it did turn out a bit dry. It may be due to the fact that we were intensely focused on the frosting, which we also made an error with. We were supposed to follow the cooked cream cheese frosting, but unknowingly followed the cream cheese frosting recipe. But, with good intentions, the latter turned out amazing. We found ourselves sneaking the frosting and wanting more each time. Luckily, there was a lot leftover and we have it stocked in our freezer, waiting to pair it with whatever we can imagine: toast, fruit - you name it! Another difficulty that we definitely need practice on is piping. Using ziplock to hold the frosting, we practiced and practiced and settled with the top five best looking cupcakes. The added red sprinkles really takes away from the amateur pipe work. The cake was dry, but the frosting makes it a 10/10. Preheat the oven to 350 F. Line a cupcake pan with 12 cupcake liners. In a small bowl, whisk together the flour, cocoa powder, baking soda and salt. In a measuring cup, combine the buttermilk, food colouring, vinegar and vanilla. In the bowl of a stand mixer fitted with the paddle attachment, mix the oil and sugar on medium speed until will combined. Add the eggs one at a time, mixing well after each addition. With the mixer on low speed, alternate adding the flour mixture in 3 additions and the milk mixture in 2 additions, beginning and ending with the flour mixture. Blend after each addition until just combined. Do not overmix the batter. Using a spoon, divide the batter evenly between the cupcake liners, filling approximately two-thirds full. Bake for 20 minutes or until a toothpick inserted in the centre comes out clean. For even baking, rotate the pan front to back halfway through. Allow the cupcakes to cool in the pan for 10 minutes before turning them out onto a wire rack to cool completely. 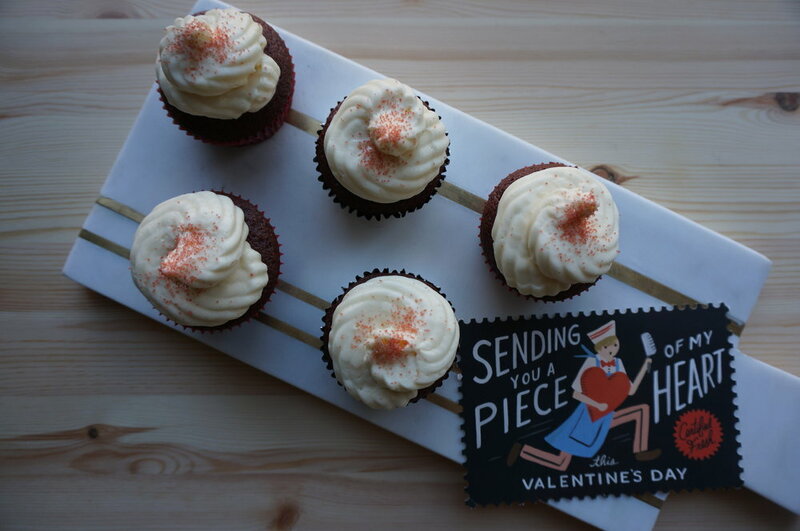 Ice the cooled cupcakes using a spoon, a small offset spatula or a piping bag and tip. Because of the cream cheese in the buttercream, the iced cupcakes may be kept at room temperature for up to 3 hours; after that, they should be stored in an airtight container in the fridge. Bring the cupcakes to room temperature before serving. The cupcake can be stored in an airtight container in the fridge for up to 3 days. In a medium saucepan, bring an inch of water to a simmer. In a large heat proof bowl, combined the egg whites and sugar. Place over the simmering water and whisk gently until it reaches 140F. Immediately pour the egg white mixture into the bowl of a stand mixer fitted with the whisk attachment. Whisk on medium-high speed until the egg whites have cooled to room temperature, doubled in volume and hold medium peaks, 8 to 10 mins. Turn the mixer to medium-high speed and add the butter a few cubes at a time, and beat until the butter is fully incorporated before adding more. Once all the butter has been added, continue to beat until the buttercream is light and fluffy, 1 - 2 min. Add the vanilla and return the mixer to medium speed. Begin adding the cream cheese a cube at a time, beating until the cream cheese is fully incorporated before adding more. Once all the cream cheese has been added, increase the speed to medium-high and beat for 2 more min. Use immediately or store in airtight container in the fridge for up to 1 week or frozen for up to 3 months. Bring buttercream to room temperature before using. If anyone asks for my favourite ice cream in Toronto, I immediate response is Roselle's earl grey soft serve with the upgrade of lemon curd and pearl chocolates. That's my favourite item on their menu, but if you haven't tried the rest of their roster like the banana eclair, lemon tart and of course their earl grey shortie - go now! I had heard of the Toronto Eats cook book from Amy Rosen being released with recipes featuring bakeries and restaurants in Toronto and when I received it for Christmas, I was excited to see what I wanted to make. Flipping through the pages, I stopped at Roselle's chapter featuring the earl grey shortie, I knew there and then, we were baking them! Ken and I have had trouble baking shortbread cookies in the past, and this one was no exception. The dough was tough to work with and we questioned how thick we were supposed to roll out the dough. The recipe called for 1 and 1/2 inches thick and we were like, "whaaaa - we don't remember it being that thick at Roselle and it's a sandwich cookie". Thanks to social media, we asked the author and Roselle. 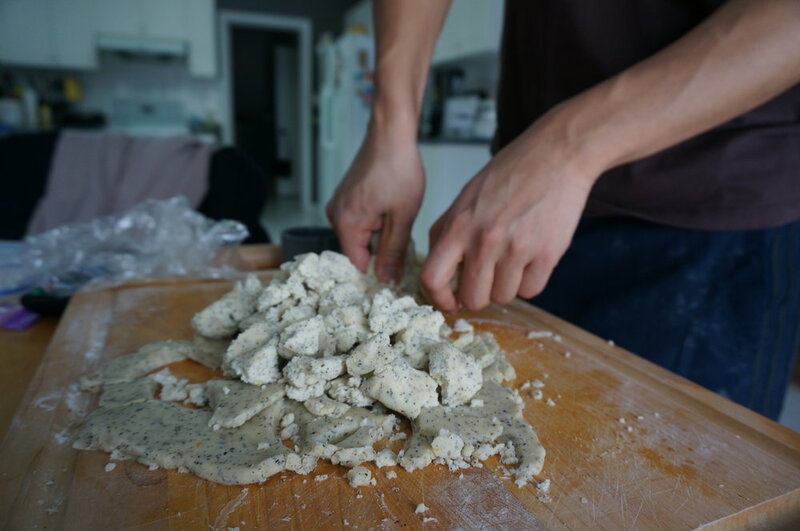 Impatient to wait for a response, we used our gut and rolled out the dough to be thinner than called for. We made two versions of this cookie: regular cookie and the sandwich version with white chocolate ganache in the middle. 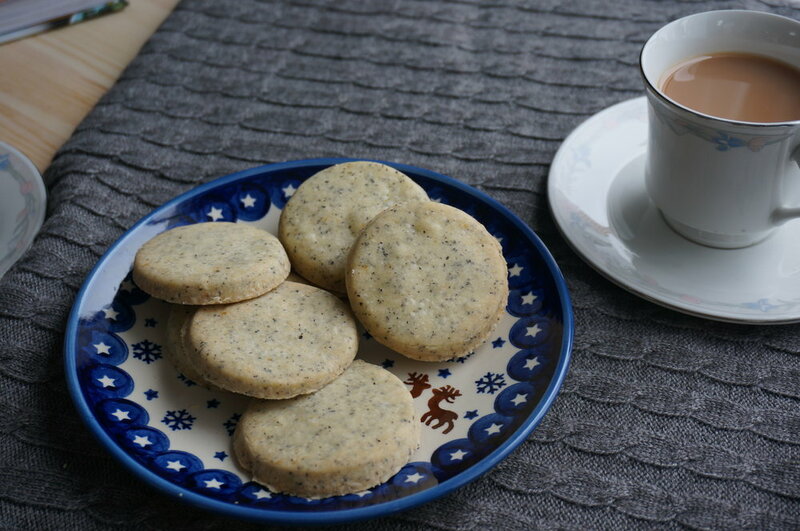 Both were a hit and we're curious to try out different types of tea to flavour the cookie with in the future. And if anyone is wondering the reason we chilled the cookies outside prior to popping them in the oven, this is when we appreciate the Canadian winters with the limited fridge space we have! Anyway - if you have not gone to Roselle yet, GO!